It’s not just a job. Make a difference in someone’s life, every day. Start (or continue) a rewarding career in social services. PSRS is always on the lookout for professional people with a passion for helping others. Whether you have experience in the disability field, or are interested in acquiring new skills, we seek those who are committed to providing quality support, with a willingness to learn, and desire to make a positive impact. PSRS promotes a Deaf friendly culture - many of our administrators and staff are Deaf, hard of hearing, or are hearing and able to communicate using basic sign language/ASL. We have video phones at our office, and at many of our sites, and we provide interpreters as needed for trainings and meetings. We also offer assistance and support to employees who want to learn sign language. PSRS is committed to creating an inclusive environment where people of different abilities have what they need to do their job. People of all backgrounds and abilities are encouraged to apply. Sign language skills are a plus! Check our employment listings for current full and part time job opportunities, and employment application. For questions or inquiries, contact employment@gopsrs.org. Make a real impact - work within a care team and ensure the person(s) you support has what they need to lead a fulfilled life in the community. This is your chance to be part of something bigger, to help another person experience empowerment, relationships, and joy in life. While supporting an individual in their daily routines is an essential function of the job, you are also an advocate, a teacher, an educator in the community, and a positive presence in someone’s life. You are learning new skills, receiving specialized training, and developing as a professional with potential to move into other positions throughout our organization. 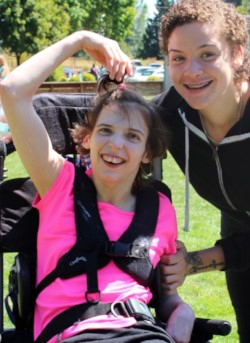 Without direct care professionals, and others who dedicate themselves to supported living, many people with developmental and intellectual disabilities would not have the freedoms they experience in the community. You play a crucial role in the life of a person who relies on specialized support to live in their own home. We understand the challenges support professionals face on a daily basis. You do incredibly important work - as with any rewarding job or career, there are often demands that can have a lasting impact. That is why it is important that you have the support you need to do your job effectively, and with personal and professional satisfaction. You are part of a team – everyone helps one another to work towards the same goal of providing quality community supports to people who need them. You receive competitive benefits because your health, financial future, and fulfillment within your job are critical. We want you to be well so that you can have the most positive impact with the individuals you support, as well as with your peers. And, it’s important you have some fun too! PSRS believes in rewarding our staff with parties, events, awards, and bonuses. So, are you ready to join a dedicated, active, mission driven team? Take a closer look at the PSRS positions below. There are occasionally other vacant administrative roles – those will be listed as available here. Community Support Specialists (CSS) also known as Direct Support Professionals or DSPs are the critical direct line of support providing in-home and community services in personalized ways that ensure each client’s needs are addressed. 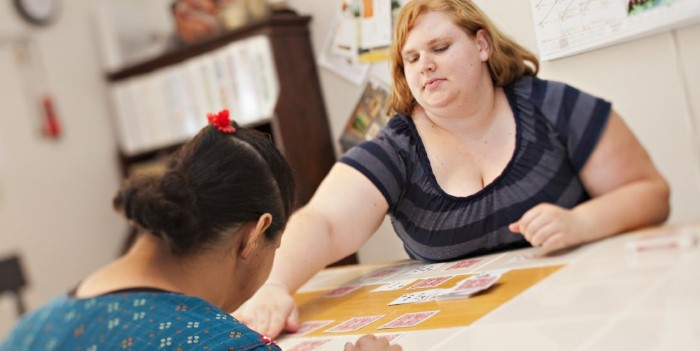 These committed CSS work alongside clients to teach independent living skills in a way that allows clients to exercise their personal power and decision-making skills, as well as participate in their daily routines and activities. From helping people navigate the bus system to supporting them in optimal hygiene and health, to paying bills and completing household chores, the Community Support Specialists find ways to empower PSRS clients. In addition, the CSS maintains documentation for all tasks completed, such as financial forms, medication records, and progress notes, and carries out programs and support plans. Organized, punctual, collaborative, trustworthy, tenacious and patient are just some of the words that describe our Community Support Specialists. If these traits sound like you and you are looking for a rewarding job that helps others, we encourage you to apply. Please take a moment to review the requirements. Program Coordinators (PCs) are essential to the team, supporting both the Program Manager and CSS. PCs work in the office, and in the field, assisting with various duties including training and on-site management. More information is available in the individual job listings. Program Managers (PMs) oversee and manage the entire program (up to 10 clients). From staffing to program support to required documentation, the PM keeps things running to ensure individuals and households receive the appropriate and necessary supports. More information is available in the individual job listings.